"Your support and prayers will be a strong encouragement for the persecuted believers in Niger who are standing strong for the Gospel of our Lord Jesus Christ." 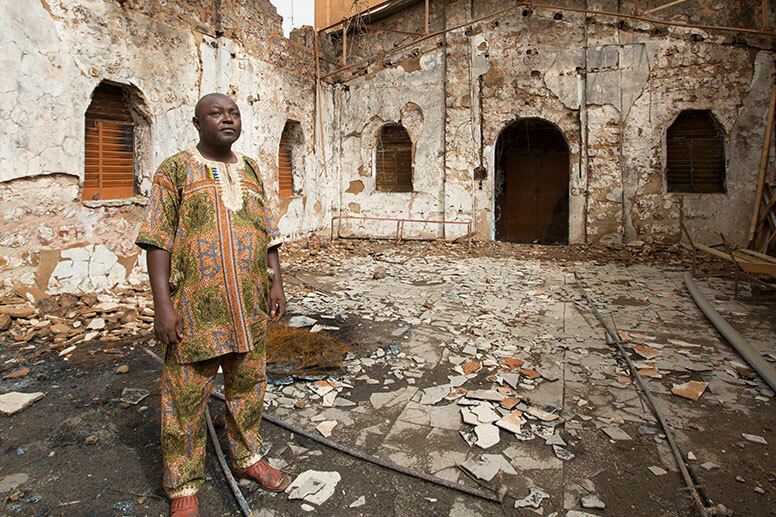 Pastor Jacques Houeto in the middle of his burned-out church in 2015. It’s been more than two years since angry Muslims began their demonstrations in Zinder, Niger, to protest a cartoon of Muhammad that appeared in the French satirical magazine “Charlie Hebdo.” The trouble started when people entered Christians’ homes, stealing what they wanted, and burning the rest. The damage quickly extended to churches and missionary schools. By the end of the next day, 70 churches across the country had been burned. Although it was a blow that no one had expected, Christians didn’t let the burnings stop them. Many churches still held services the following day. Across Niger, they stood among rubble and ashes under the sweltering desert sun and sang praises to God. “Either you die for nothing, or you stand for your faith,” said Bishop Kimso Boureima, president of the Evangelical Alliance in Niger. While the congregations met outside, surrounded by reminders of what had happened, the pastors preached forgiveness. Many admitted that it was difficult. They sometimes stood in front of angry groups of Christians and had to remind them of God’s love. Bishop Kimso Boureima, president of the Evangelical Alliance in Niger, says that the faith of the churches is not in vain. Christians across Niger slowly put down their desire for revenge in favor of forgiveness. Many made public statements and reported that their Muslim neighbors showed remorse for their actions—some even cried when they heard the message. Meeting outside was not a longterm option for the churches. Temperatures in Niger can reach 130 degrees, and church services often last three hours or more. But all of the churches knew they would be unable to rebuild the buildings that once stood. Missionaries built most churches in Niger in the 20th century with materials shipped from other countries. They had been big, expensive endeavors that the churches—now run by locals—couldn’t afford to replace. 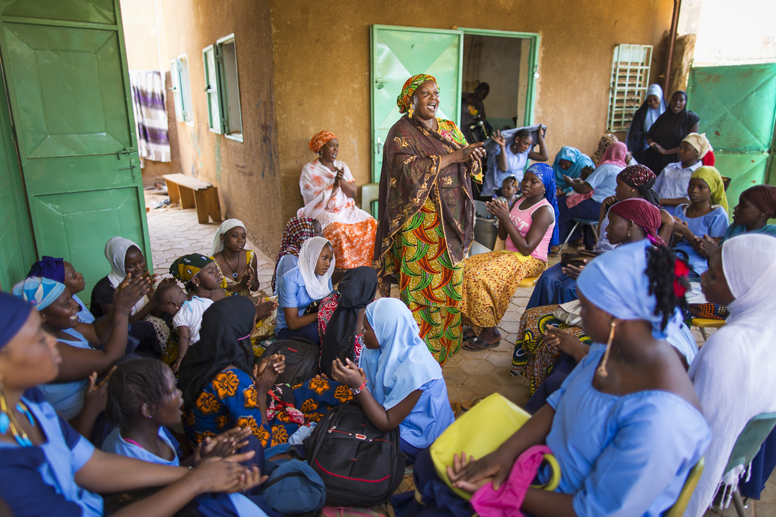 In July 2015, Samaritan’s Purse announced a plan to rebuild 20 churches in Niger. Thanks to support from many donors, we surpassed our financial goal and are working to rebuild even more churches. Read the stories of six churches below. One of the largest and oldest churches in Niger with around 500 members, the Baptist Church at the Round Point was built in 1929 by American missionaries, with most materials brought from the U.S. When the building was burned in 2015, the church didn’t have the equipment necessary to build back what they once had. But that didn’t stop them from meeting amid the rubble and ashes after the burnings. Soon, they had used iron from the burned roof to build a temporary shelter. Members from the church began going into the community and forgiving their neighbors. They also distributed Operation Christmas Child shoeboxes to Muslim children, bridging the gap that had formed since the burnings. Samaritan’s Purse is helping to build the church building back, and, with significant contributions from the congregation's members, the new church will be almost double the size of the first church. Pastor Jacques Houeto hopes this will give the church room for new children’s programs and more classes. He also hopes that the church will be able to host more community events, bringing neighbors into the church. “It’s really a miracle for us to see this building,” Jacques said. 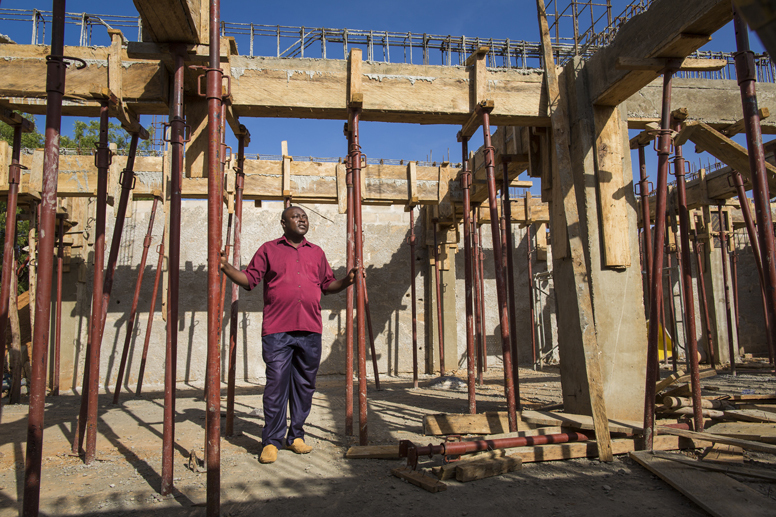 Pastor Jacques Houeto stands inside the frame of the new Church at the Round Point. Church members have been encouraged to see the progress of the building, and it has persuaded people who were passive in their faith to begin attending church again. Despite the violence, no Christians died in the attacks. Many were warned beforehand and were able to escape. Pastor Issa Elhadjkouldjami has a church in Zinder, sometimes described as the heart of radical Islam in Niger. He took his family and church members to the local gendarmerie base after his son heard a warning from children at school. Since the burnings, the church has two new converts. The first was a man who was watching some demolition before rebuilding could occur. He started talking with church members and has faithfully attended since that day. The other was a woman who lives close to the church. She talked with a church member about the burnings, and after a few conversations, he led her to Christ. Jacques thinks that the church will be so successful in reaching the community that he hopes they can plant a church to strengthen the faith of more new converts. He believes that, one day, Niger, which is currently around 98 percent Muslim, can become a Christian country. 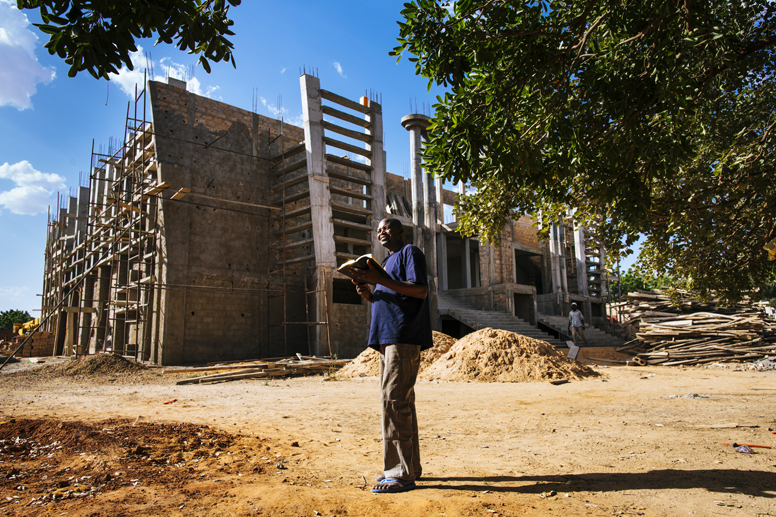 Pastor Zackariah Jadi watches construction of Salama Church in October 2016. The church was completed in time for a Christmas service. The word “salama” means “peace.” For years, Salama Church always had its doors open for its 200 members and for community members, including Muslims. There were prayer meetings, women’s fellowship, youth meetings, and choir practice in addition to the regular Sunday service. Pastor Zackariah Jadi and his family lived on the edge of the church compound, so when rioters burned the church, they also destroyed his home. Zackariah was warned and had escaped with his family, but they hadn’t had time to take clothing, important documents, other necessities, or irreplaceable items. Despite their circumstances, the church didn’t stop proclaiming the Gospel. Without chairs, electricity, or running water, the church continued to meet. Church members were able to find a new home for Zackariah, and Samaritan’s Purse committed to rebuild the church. The new church building opened just in time for a Christmas service in December 2016 and is bigger than the old facility, which Zackariah said is a welcome challenge. He looks forward to filling it with new converts. Since the burnings, Zackariah said many members have recommitted themselves to Christ, and he has seen the faith of the congregation grow stronger. Their boldness has impacted the community, especially when members gave Operation Christmas Child shoeboxes to the children of people who had helped burn the church. Zackariah said he has already seen new converts in the community, and he’s had the opportunity to share about Christ with government leaders. He believes the persecution will purify and strengthen the church. Boukoki is the largest evangelical church in Niger. When it was built in 1976, it was one of only five Christian churches in Niger. When community members marched from the local mosque to Boukoki to burn the building and books, rip off the roof, and dig out electrical sockets, church members knew they would be unable to rebuild. In the week after the burnings, the church continued to meet. There was a surge in attendance, especially at the prayer meetings. Church members quickly arranged to distribute Operation Christmas Child shoeboxes to their neighbors. Since then, they have continued distributions in several surrounding villages. Boukoki met in a temporary shelter for a time. Though hot and uncomfortable, Maman said his congregation didn’t complain. In addition to support from Samaritan's Purse, Boukoki raised funds for its rebuild project and has also worked to improve the roads around the church, which has helped the entire community. Maman said he hopes that the new building will allow the church to implement more projects for the surrounding community. Pastor Maman Halidou Kashe looks forward to the impact Boukoki Church will make in its community when the building is finished. It will be the biggest evangelical church in Niger. When Pastor Emile Yeye and his wife, Kadidia, first saw the remains of their church, they fell on their knees and worshipped God, despite their pain. As quickly as possible, they gathered their church members and asked them to pray that God would forgive the people who had burned their church building. 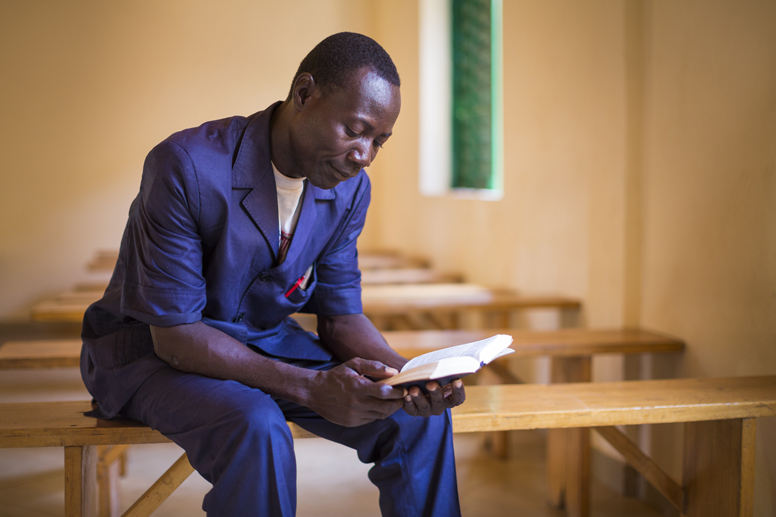 Emile said he took each teaching opportunity to preach about forgiveness, and, after two weeks, he saw his congregation’s hearts begin to mend amid the rubble they were meeting in. Members of CIE MIA Niger gathered immediately after the burnings and prayed for the forgiveness of the people who burned their building. Although members knew they wouldn’t be able to complete a rebuild on their own, they began repairing the walls and roof. That’s when Samaritan’s Purse stepped in to help by finishing the roof and ceiling, painting, and doing all the electrical work. In March 2016, the new church building opened its doors. In the year that the congregation went without a building, they had grown closer and learned to rely on God more. 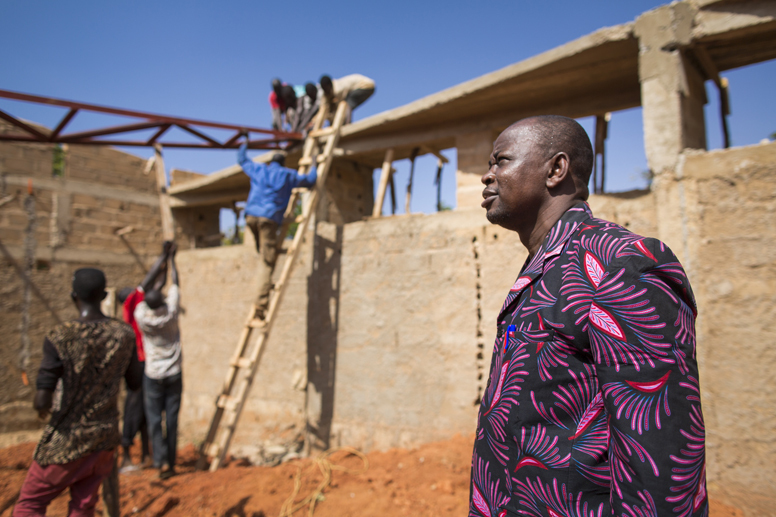 Upon seeing the completed building, Emile said they realized that God had never left them. There was a special church service to celebrate the finished work. The church is using its new building as a base for prison and hospital evangelism, sharing the Gospel one-on-one with people who desperately need it. The new building also hosts celebrations throughout the year, including for Christmas and Easter. Emile said the church has invited Muslims neighbors to join in, and several people have accepted those invitations. 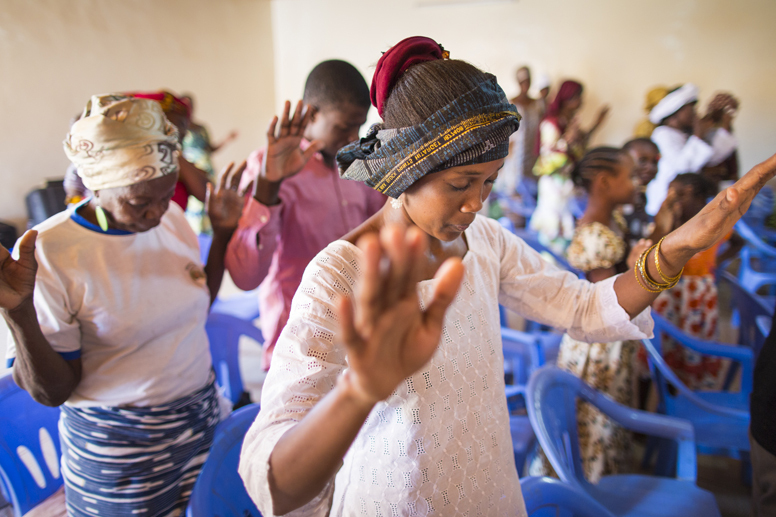 Members of CIE MIA Niger worship together in their new building. When Muslim neighbors burned Harobanda's building, they assumed the church would leave the area. But church leaders quickly cleaned away the debris and held a short service of encouragement the next day. While many members were fearful and sad afterward, they quickly decided to rebuild. The members continued to spend time with their neighbors and showed kindness to them despite their involvement in the burnings. Most of the protesters close to Harobanda were young people. Eventually older members of the Muslim community went to the younger ones and asked them to return items they had stolen, including the church benches. With these items back in their possession, the church didn’t have to worry about buying all new materials. But they knew they could not afford the expense of a rebuild. When Samaritan’s Purse agreed to rebuild the building, the church knew their prayers had been answered. With the renovation, trust in God grew again. Pastor Bilimpo Ouoba is pleased with the outreach that has started in the community surrounding Harobanda since the church was burned. Since the church has a new building, the youth have started an outreach program in the community. Bilimpo said their neighbors used to be hostile, but now they are open to the church's ministry. A recent convert has begun attending Harobanda, and Bilimpo hopes that person will be just the first of many more Nigeriens to come to Christ. Pastor Issa Moussa was sitting under a tree at Bethel Horizon with a church elder when the attacks began. Neighbors chased away the first wave of would-be attackers. When the next wave arrived, the result was the same. But when a third group came with machetes and stakes, Issa asked his neighbors to step down because he didn’t want bloodshed. “When we realized it’s going to be a massacre, we decided to just not oppose,” he said. The attackers broke down the church doors, stole everything they wanted, and set fire inside the church. The same neighbors who had tried to protect the church tried to quench the fire, but it was too late. Since Harobanda's church building has been rebuilt, the pastor's wife, Aissa, has started a ministry for women. While the smoke still billowed, Bethel Horizon members came to the church to clean the debris. On Sunday, the next day, they returned to pray. Over the following months, the members bought chairs, a sound system, and instruments. When Samaritan’s Purse came alongside the church, they provided the ceiling, wiring, lights, paint, and all finishing touches. The church celebrated its new building in May 2016, and many Muslim neighbors came to see the completed project. Among other activities, the new building is being used by Issa’s wife, Aissa, for a women’s ministry. She starts each session with prayer and then shares the Word of God. Aissa said that some participants have received Christ and others have stopped their daily Islamic prayers and rituals. She is also teaching them vocational skills, such as sewing, and is slowly seeing change in the community. 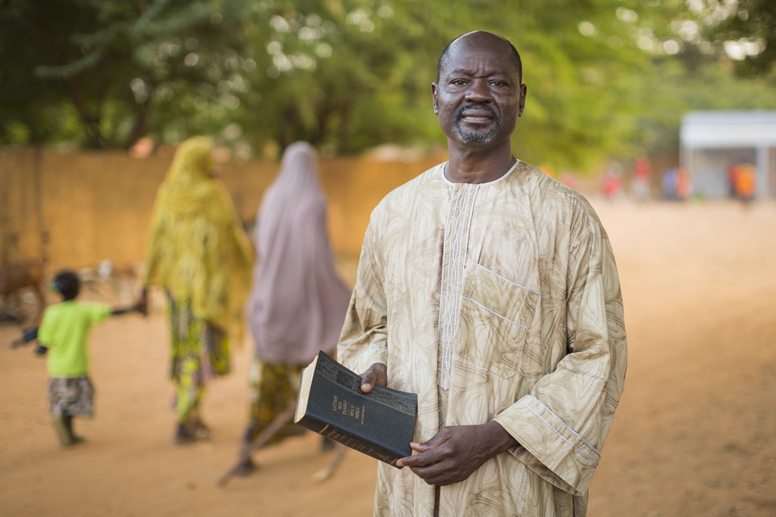 “I have big hope for the church in Niger,” Issa said. Chapter 7: How Can You Help? Since July 2015, Samaritan’s Purse has worked with local Christians to rebuild 22 church buildings, and 10 more are currently in progress. By the end of 2017, we will have rebuilt or renovated 43 churches. “We are encouraged, we are strengthened, and we believe our faith is not in vain,” Bishop Kismo said. But that’s not the end of the story. Many churches, like the Baptist Church at the Round Point, are planning to plant churches as the Christian population around them grows. Samaritan’s Purse is aware of 45 newly formed churches that need buildings. 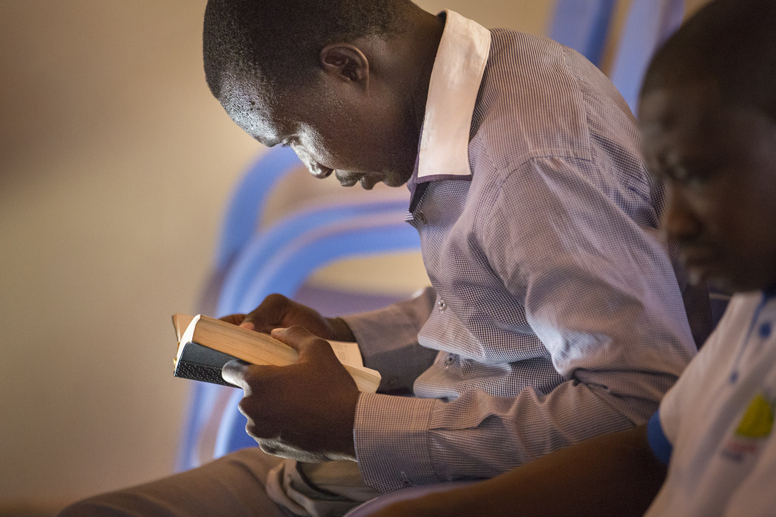 We hope to also help with these needs and to train pastors in Niger who currently have little to no Biblical education. The Nigerien church is thankful for the support from our donors. Please continue to pray for these churches as they reach out to Muslims in their communities and for newly formed churches as they wait for meeting spaces. Your support can help us continue to spread the Gospel in Niger.